What are the effects of our travels on the local populations? Is tourism bringing them business and the opportunity to improve their lives, or rather just another form of exploitation that takes dignity away? Let’s cut the chase: it was recommended by Lonely Planet. Page 75 of the Cambodia guide, there’s a callout inviting travelers to go give blood at the National Blood Transfusion Centre. After 23 days of selfish traveling I felt the need to be a gud man and give something back so I embraced the idea of leave behind more liquids than I planned to. I checked with Roberts, the very helpful Brit owner of Nomads Encounters hostel where I stayed. Talkative as usual, he recommended me to do the donation at the Kantha Bopha pedriatic hospital, next to the Wat Phnom temple. 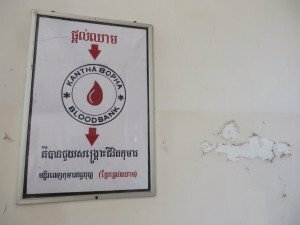 The hospital, founded by a Swiss doctor, has a blood bank for the little patients and is not involved with buy-and-sell business of the red gold as other centers do. It was with my hearth full of joy of giving that the sunny morning of Sunday November the 23rd I walked up to the Kantha Bopha institute. 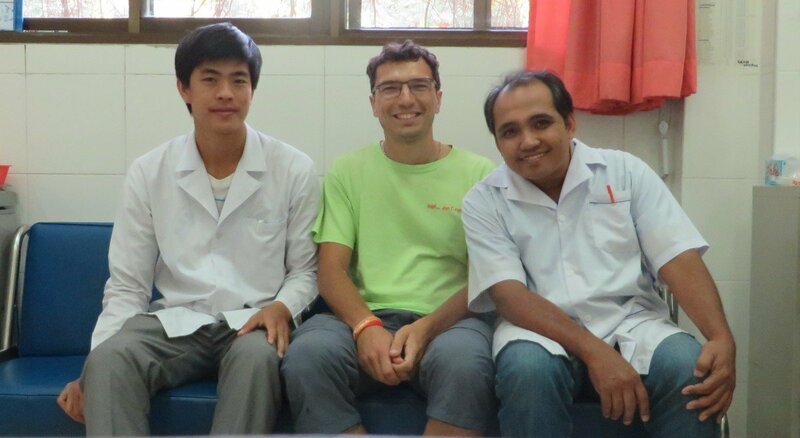 Cambodia has a critical shortage of blood. There’s a stigma about donating blood and diseases that can be contracted, mainly because of misinformation and lack of hygiene back in the days. The result is that only family members of the sick relative in need are normally giving blood, always if they have compatible types. Consider that for a single patient with dengue fever, four sacks of blood are needed! 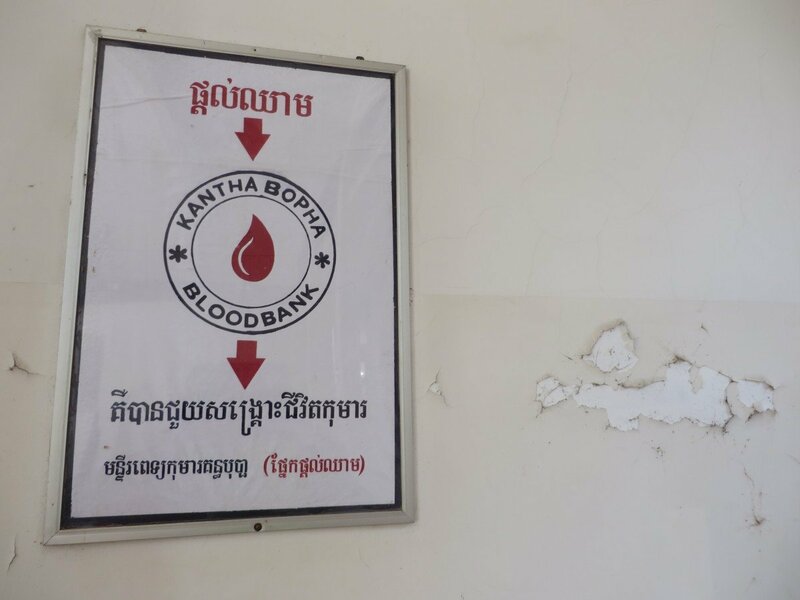 Campaigns are being run through the country to raise awareness among the Cambodians, but in the meantime is a good idea to give some of your blood away – the right way – if you’re visiting! A security guard, unable to explain in English, walked me to the blood bank section. The white, clean and freezing air conditioned room was empty. Two men in white uniform materialized, welcoming me with an entrusting smile. They explained how it works and made me fill-in a form before proceeding to prick my finger and get a blood sample to analyze. Few minutes after the test results were ready: “you can donate blood”, Doc said. While the 300 milliliters bag was filling up I kept my mind distracted. I did try to donate blood three times in Italy when I was 18. A donation is 450 milliliters there and I always ended up feeling horrible. The first time they blamed the tension, the second time the breakfast, and the third time they told my body was still developing and had to wait few years. 17 years later I thought that my body had complete the developing process, but anyway I fainted soon after the donation was over! I sat on the side of the bed and told the Doc that I wasn’t feeling great. Next thing I know, I felt my body moved by two hectic men I had no memory of, my head busy with some intense thought I could nor remember, brought back to reality too quickly just to think a “who the [email protected] are they?!”. They laid me down on the bed again and made me drink some Fanta – good source of sugar. I ended up staying a good 40 minutes resting and trying to sleep. The staff was really taking care of me, and reassuring that this happens “many many times here!”. 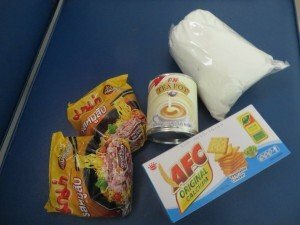 At the end, I was given a goody bag with a T-Shirt, two packs of noodles, one kilo of white sugar, a can of condensed milk, a package of salty crackers (that I ate instantly), a set of iron & vitamins pills to take in the next days, and a ticket to collect my blood results few days later. And best of all, the staff was genuinely grateful for the donation! To complete my do-gooder day, I gave the kilo of sugar to a mother begging in the street and went for dinner at Friends, a cool restaurant run by an organization employing street children. You look really pale in the pict after donating blood! That’s a good slogan 🙂 Interesting fact what you say about the reasons to donate (or the reasons for Cambodian people not to donate). Did not think about this much before. I love your heart for the children – I’m sure your blood has helped save a life, as other of your activities did, without any doubt. I’m sure it helped, and I hope this post will help to have more people donating. Hola habibi, I am proud of you!